Competition for the GUARDIAN “dope reporter award” is heating up among the local newsies. Not to be outdone by the crosstown rivals at KTVB, Jeff Platt of KBOI-TV 2 got caught Wednesday evening playing in a canal. While sternly warning viewers about the dangers of easily accessible canals and the number one cause of death for young children being drowning, guess where reporter Platt was spotted? He was wearing hip boots, recording each step with a Go-Pro camera as he sloshed his way along the canal toward the camera. Something about TV reporters and playing in the water. Even the kids who apparently lost a football to the water had enough sense to stay out of the ditch, at least on camera. It’s too bad that Morgan used the classy response. This is #2 for Platt. It’s not news, it’s fluff. My guess editor, this is the empire striking back at you for making fun of their hottest babe doing their dumbest trick. 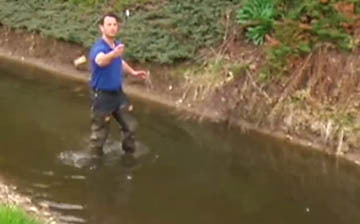 The story teller is in fact demonstrating to viewers and children how one can go in the canal and live to tell about it. It is akin to driving recklessly or driving drunk to demonstrate why one should not. It’s all fun and games until you have to start doing the body recoveries later this year on the several drownings that will happen in those same canals. The canal company should trespass and fine all the TV stations to stop this stupidity. Maybe he’ll touch a downed wire after the wind storm? Like the other poster said, I don’t watch the TV news anymore. Too much fluff while Rome burns. Hey it’s the same roving reporter who won the award for reporting on major changes to a busy intersection from over a mile east of the actual location! This reminds me of KBCI’s hilarious ad campaign in the late 80s and early 90s, when they infamously touted,” here at Channel 2 we’re number 2 and we don’t like it.” So let’s portray news in the form of entertainment and put Jeopardy and Wheel of Fortune on at 6:00 so we can boost our ratings against the news at KIVI and KTVB. Like Mr. Rome said, I don’t watch the local news anymore as there is too much fluff and not enough real information. No wonder there’s so much government corruption that goes uncovered. I guess the only thing left to do now is go for the threepeat! A win is a win! I have no regrets.